The Pilgrims, Puritans and our Founding Fathers understood that God created the institution of human government and had a lot to say about it in the Bible. From America’s birth though the Greatest Generation, Biblical morality permeated our society and Biblical principles were evident in our Public Policy. Within the last generation, Christians have been told to abandon the culture and leave political issues to unbelievers. Now we are suffering the consequences. 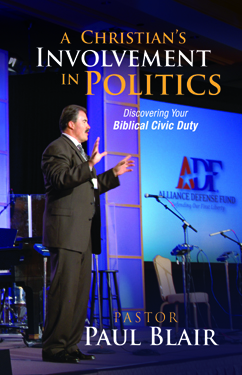 A Christian’s Involvement in Politics answers fifteen most often heard excuses for Christian apathy, and also provides suggestions for helping to Reclaim America for Christ.